The causes are several but the result is the same, muscle cramping. Tying-up or azoturia is a muscle metabolism problem. If the cramping is severe enough then the myoglobin released from the damaged muscle goes from blood to kidneys and into the urine, turning the urine a dark red color. 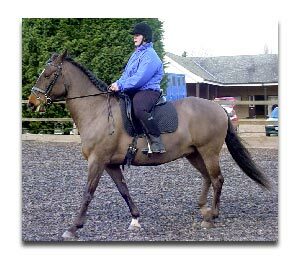 Most cases of tying-up are not that severe and usually present as a horse that has been off for several days and is then exercised aggressively. In the middle of the ride (or sometimes right at the end) the horse’s stride shortens and he cramps up. Photo on the right shows an azoturia affected horse. Treatment is usually routine in that anti-inflammatories, small doses of sedative, muscle relaxants and in some cases IV fluid therapy gets the job done. 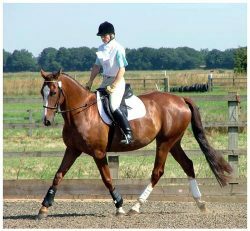 The horse is then put on a very low energy diet for at least 1 week and blood muscle enzyme levels are obtained to assess the damage. The bigger challenge is to figure out why it happened in the first place and to prevent it. One of the more common causes of azoturia in mares is the hormonal effect of coming into heat (estrus). Many young fit and athletic mares who are on a good nutritional and exercise program tie-up because they are in heat. Some other common causes are high levels of protein and energy in the diet and poor electrolytic supplementation in hot weather. Prevention involves the use of potassium salt and baking soda supplementation in the feed. Making sure that dietary energy and protein levels are not too high and that you are aware of predisposing factors such as estrus in your mare or a lameness that is overlooked.